The Beautiful Nuthatch—one of the largest nuthatches—is also one of the most attractive birds in the world. 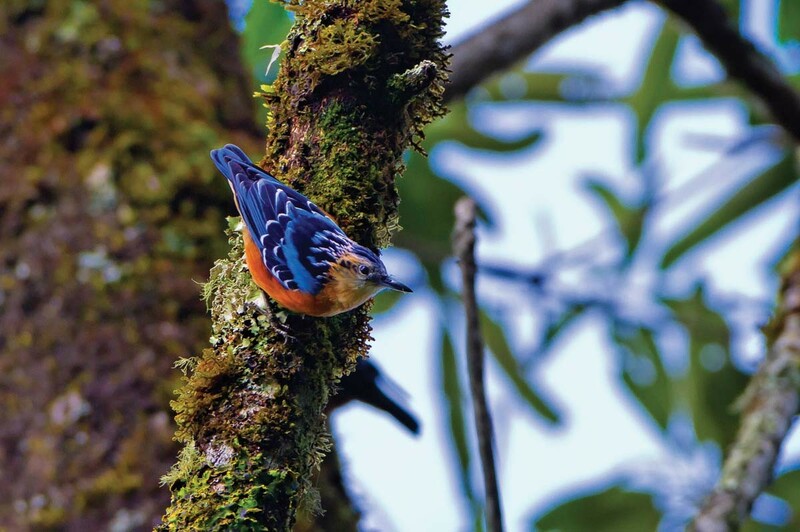 Described by well-known British zoologist Edward Blyth, in 1843, from a specimen collected from Darjeeling, the Beautiful Nuthatch is sporadically distributed in Northeast India apart from parts of South-East Asia. Although considered a part of the Sitta genus, same as all other nuthatches, the Beautiful Nuthatch is quite varied from all other species in the nuthatch family. The brilliantly coloured bird has black and azure markings on the top with streaks of white and blue, while the belly is orange. Typical of nuthatches, the Beautiful Nuthatch has a straight, long and sturdy black bill. The nuthatch inhabits mountainous evergreen and semi-evergreen forests, generally between the altitudes of 3,100 ft and 7,500 ft, but is known to migrate altitudinally and has been recorded at an altitude of 1,100 ft during the winters. This nuthatch feeds on insects, larvae of insects and other invertebrates on branches and trunks of large trees covered with epiphytic plants. Like all arboreal nuthatches, it has a behaviour of hopping on trunks and branches with their heads facing down, as well as hanging upside down while foraging. Foraging mostly solitarily, but sometimes in pairs or in small flocks, the Beautiful Nuthatch is found from mid-level to the topmost branches of tall trees while hunting for prey. They are mostly seen in mixed-hunting parties along with Himalayan Cutias, Velvet-fronted Nuthatches, Long-tailed Broadbills, Lesser Racket-tailed Drongos, Maroon Orioles and White-browed Scimitar Babblers. Although the breeding ecology of the bird has not been studied well, in Northeast India the nuthatch breeds between April and May. Nests are often build in holes, constructed with leaves, bark and fur of mammals and sometimes even mud. The Beautiful Nuthatch has always been a rare bird to find, with highly localised populations in the areas wherever it occurs. As the bird has a small population (between 2,500 and 9,999 mature individuals) which is highly fragmented and on the decline, the Beautiful Nuthatch is listed as a Vulnerable species by IUCN. Major threat identified for the species is forest loss, resulting in degradation of habitat and fragme ntation of populations, caused due to shifting agriculture, timber extraction, overgrazing and burning of forest. Hunting in parts, although considered to be a minor threat, is also recognised to be affecting the population. 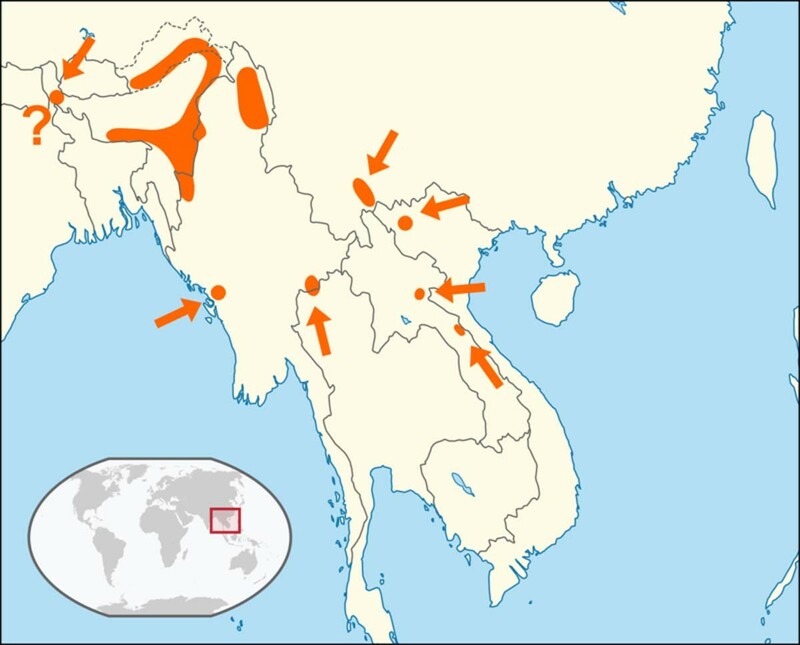 Of the countries in which the bird is distributed, the species enjoys protection by law in Thailand and Myanmar, but there is no protection offered in China, India, Laos, Vietnam and Bhutan. The bird, however, mostly occurs in protected areas throughout its range, which seems to have afforded it some level of protection. Several steps have been suggested to further the conservation efforts required to ensure the protection of the species. These include surveys in areas which form the current gaps in distribution to understand the exact range of the bird, identifying key populations, prevention of large-scale montane timber extraction and promotion of conservation awareness initiatives among hill and mountain communities. The striking nuthatch, although not on the brink of extinction, needs a little help from us in order to ensure its survival in the long run.